This article is about the order Trypanosomatida, see also the genus Trypanosoma. Trypanosomatida is a group of kinetoplastid excavates distinguished by having only a single flagellum. The name is derived from the Greek trypano (borer) and soma (body) because of the corkscrew-like motion of some trypanosomatid species. All members are exclusively parasitic, found primarily in insects. A few genera have life-cycles involving a secondary host, which may be a vertebrate, invertebrate or plant. These include several species that cause major diseases in humans. The three major human diseases caused by trypanosomatids are; African trypanosomiasis (sleeping sickness, caused by Trypanosoma brucei and transmitted by tsetse flies), South American trypanosomiasis (Chagas disease, caused by Trypanosoma cruzi and transmitted by triatomine bugs), and leishmaniasis (a set of trypanosomal diseases caused by various species of Leishmania transmitted by sandflies). The family is known from fossils of the extinct genus Paleoleishmania preserved in Burmese amber dating to the Albian (100 mya) and Dominican amber from the Burdigalian (20–15 mya) of Hispaniola. The genus Trypanosoma is also represented in Dominican amber in the extinct species Trypanosoma antiquus. Three genera are dixenous (two hosts in the life cycle) – Leishmania, Phytomonas and Trypanosoma and the remainder are monoxenous (one host in the life cycle). Paratrypanosoma appears to be the first evolving branch in this order. Fifteen genera are recognised in the Trypanosomatidae and there are three subfamilies – Blechomonadinae, Leishmaniinae and Strigomonadinae. The genera in the subfamily Strigomonadinae are characterised by the presence of intracellular bacteria. Some trypanosomatids only occupy a single host, while many others are heteroxenous: they live in more than one host species over their life cycle. This heteroxenous life cycle typically includes the intestine of a bloodsucking insect and the blood and/or tissues of a vertebrate. Rarer hosts include other bloodsucking invertebrates, such as leeches, and other organisms such as plants. Different species go through a range of different morphologies at different stages of the life cycle, most have at least two different morphologies. Typically the promastigote and epimastigote forms are found in insect hosts, trypomastigote forms in the mammalian bloodstream and amastigotes in intracellular environments. The six main morphologies of trypanosomatids. A variety of different morphological forms appear in the life cycles of trypanosomatids, distinguished mainly by the position, length and the cell body attachment of the flagellum. The kinetoplast is found closely associated with the basal body at the base of the flagellum and all species of trypanosomatid have a single nucleus. Most of these morphologies can be found as a life cycle stage in all trypanosomatid genera however certain morphologies are particularly common in a particular genus. The various morphologies were originally named from the genus where the morphology was commonly found, although this terminology is now rarely used because of potential confusion between morphologies and genus. Modern terminology is derived from the Greek; "mastig", meaning whip (referring to the flagellum), and a prefix which indicates the location of the flagellum on the cell. For example, the amastigote (prefix "a-", meaning no flagellum) form is also known as the leishmanial form as all Leishmania have an amastigote life cycle stage. Amastigote (leishmanial). Amastigotes are a common morphology during an intracellular lifecycle stage in a mammalian host. All Leishmania have an amastigote stage of the lifecycle. Leishmania amastigoes are particularly small and are among the smallest eukaryotic cells. The flagellum is very short, projecting only slightly beyond the flagellar pocket. Promastigote (leptomonad). The promastigote form is a common morphology in the insect host. The flagellum is found anterior of nucleus and flagellum not attached to the cell body. The kinetoplast is located in front of the nucleus, near the anterior end of the body. Epimastigote (crithidial). Epimastigotes are a common form in the insect host and Crithidia and Blastocrithidia, both parasites of insects, exhibit this form during their life cycles. The flagellum exits the cell anterior of nucleus and is connected to the cell body for part of its length by an undulating membrane. The kinetoplast is located between the nucleus and the anterior end. Trypomastigote (trypanosomal). This stage is characteristic of the genus Trypanosoma in the mammalian host bloodstream as well as infective metacyclic stages in the fly vector. In trypomastigotes the kinetoplast is near the posterior end of the body, and the flagellum lies attached to the cell body for most of its length by an undulating membrane. Opisthomastigote (herpetomonad). A rarer morphology where the flagellum posterior of nucleus, passing through a long groove in the cell. Amastigote: False colour SEM micrograph of amastigote form Leishmania mexicana. The cell body is shown in orange and the flagellum is in red. 219 pixels/μm. Promastigote: False colour SEM micrograph of promastigote form Leishmania mexicana. The cell body is shown in orange and the flagellum is in red. 119 pixels/μm. Trypomastigote: False colour SEM micrograph of procyclic form Trypanosoma brucei. The cell body is shown in orange and the flagellum is in red. 84 pixels/μm. 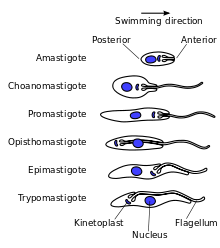 Notable characteristics of trypanosomatids are the ability to perform trans-splicing of RNA and possession of glycosomes, where much of their glycolysis is confined to. The acidocalcisome, another organelle, was first identified in trypanosomes. ^ Podlipaev S (May 2001). "The more insect trypanosomatids under study-the more diverse Trypanosomatidae appears". Int. J. Parasitol. 31 (5–6): 648–52. doi:10.1016/S0020-7519(01)00139-4. PMID 11334958. ^ Poinar, G. (2008). "Lutzomyia adiketis sp. n. (Diptera: Phlebotomidae), a vector of Paleoleishmania neotropicum sp. n. (Kinetoplastida: Trypanosomatidae) in Dominican amber". Parasites & Vectors. 1 (1): 22. doi:10.1186/1756-3305-1-22. PMC 2491605. PMID 18627624. ^ a b c d e Hoare, Cecil A.; Wallace, Franklin G. (1966). "Developmental Stages of Trypanosomatid Flagellates: a New Terminology". Nature. 212 (5068): 1385–6. doi:10.1038/2121385a0. Engstler M, Boshart M; Boshart (November 2004). "Cold shock and regulation of surface protein trafficking convey sensitization to inducers of stage differentiation in Trypanosoma brucei". Genes Dev. 18 (22): 2798–811. doi:10.1101/gad.323404. PMC 528899. PMID 15545633. Janovy, J; Roberts, L.S. (2005). Foundations of Parasitology (7th ed.). New York NY: McGraw Hill. pp. 61–69. Legros D, Ollivier G, Gastellu-Etchegorry M, et al. (July 2002). "Treatment of human African trypanosomiasis--present situation and needs for research and development". Lancet Infect Dis. 2 (7): 437–40. doi:10.1016/S1473-3099(02)00321-3. PMID 12127356. Matthews KR (January 2005). "The developmental cell biology of Trypanosoma brucei". J. Cell Sci. 118 (Pt 2): 283–90. doi:10.1242/jcs.01649. PMC 2686837. PMID 15654017. Matthews KR, Gull K; Gull (June 1994). "Evidence for an interplay between cell cycle progression and the initiation of differentiation between life cycle forms of African trypanosomes". J. Cell Biol. 125 (5): 1147–56. doi:10.1083/jcb.125.5.1147. PMC 2120053. PMID 8195296. Seed JR, Wenck MA; Wenck (June 2003). "Role of the long slender to short stumpy transition in the life cycle of the African trypanosomes". Kinetoplastid Biol Dis. 2 (1): 3. doi:10.1186/1475-9292-2-3. PMC 165594. PMID 12844365. Shadan S (May 2009). "Microbiology: Signals for change". Nature. 459 (7244): 175. doi:10.1038/459175a. PMID 19444199. Sherwin T, Gull K; Gull (June 1989). "The cell division cycle of Trypanosoma brucei brucei: timing of event markers and cytoskeletal modulations". Philosophical Transactions of the Royal Society B. 323 (1218): 573–88. doi:10.1098/rstb.1989.0037. PMID 2568647. "African trypanosomiasis". World Health Organization. August 2006. Wikimedia Commons has media related to Trypanosoma.